Egg for Baby - When Can Baby Eat Eggs? When can I feed my baby eggs? Do babies have to wait to eat eggs to avoid an allergy? Eggs are in the top 8 of all allergens but recommendations for introducing eggs to babies have been changing. It is the white of the egg that is allergenic and not the yolk. A 2008 study, and many studies done after, indicated that waiting to introduce eggs to your baby may not prevent any atopic (i.e. ezcema) disease(s). Many are now suggesting that babies may be introduced to whole eggs from the start (for those with no known history of food allergies and/or egg allergies). Read more below! Many pediatricians say that introducing egg yolks are typically fine for <the non-allergic> baby around 8 months old; this recommendation is changing however with many doctors suggesting that egg yolks, and the whole egg, make a great first food. The yolk of an egg does not contain the proteins that cause an allergy to eggs. It is very rare for anyone to be allergic to the yolk of an egg. The egg whites on the other hand, contain 4 proteins that can range from mildly to highly allergenic. Most pediatricians say that egg whites/whole eggs should not be fed to baby before 1 year of age however recommendations are changing. Australian Study (2010) finds infants given egg after 12 months of age are up to five times more likely to develop allergies compared to those who are introduced to eggs at four to six months, depending on how the egg is cooked. Many studies that have been done on infants who have egg allergies find that by the time the infant has reached age 5, the allergy has been outgrown. This is good news as the egg is highly nutritious and an important part of ones diet. As in the process of any allergic reaction, an egg allergy occurs when the body mistakes an egg protein as a harmful invader. The body reacts by releasing antibodies called immunoglobulin E(IgE). The IgE in turn prompts the body to release chemicals known as histamines. When the histamines are released, the body reacts by producing symptoms such as runny nose, itchy eyes, a skin rash and in severe cases, anaphylaxis. Diagnosing an egg allergy in an infant is really hit or miss and that is why it is very important to follow the 4 Day Wait Rule when introducing your baby to new foods. If you feel that your baby may have an egg allergy, you may want to begin an Allergy Elimination Diet to determine if the suspect is indeed an egg. It is the protein ovalbumin, which is the major allergen and it makes up fifty percent of an egg white. When should I feed my baby egg yolks? As mentioned, egg yolk allergy is very rare and many medical resources are now recommending egg yolk as a great first food for babies. 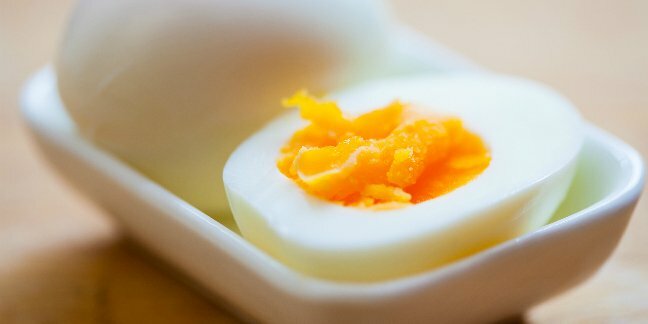 If your family has a history of egg allergies, then it is best to wait until after 12 months old to introduce egg yolks even if recommendations for introducing eggs are changing.. There are ways of preparing egg yolks so that the white is not eaten however it is possible that some of the egg white protein may still be on the yolk itself. Can my baby eat baked goods with whole eggs in them? Many pediatricians will say that using a whole egg in a baked good recipe (for the non-allergic baby/child) is fine for the infant who is between 8-9 months old. If your baby has had any reactions to foods that you are sure of, it is probably best to use a substitute for eggs in the recipes. Note: A shiny glaze or yellow glaze on baked goods usually indicates the presence of egg. Do Vaccines Contain Egg Proteins? You should note that many of today’s vaccinations are now suspended in egg white protein as a preservative. Ordinarily, persons who are able to eat eggs or egg products safely can receive these vaccines. The MMR (measles, mumps and rubella) vaccine does not contain a large amount of the egg white protein and a reaction is unlikely to occur in those with egg allergies. In fact, many MMR vaccines produced today do not contain any egg protein at all. The Flu shot and Yellow Fever vaccine however do contain egg protein and those with egg allergies should not receive the Flu shot or the Yellow Fever vaccine. Click Here for a list of all vaccines and their ingredients (U.S.).